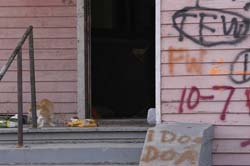 This is Pam Leavy's latest pictorial update of the struggle that still exists on the streets of New Orleans for our smallest victims. Images are current. She has been one of the most diligent and conscientious feeders. Her chosen area of concentration is the lower 9th Ward. Although her images reflect a specific area, the overpopulation problem has gotten worse all over the city due to so many animals not spayed or neutered, left on the street. With few residence, no food and more animals the starvation problem is rampant. A simple TNR program is not the solution because there is little food available and areas are uninhabitable. Our focus must be to pick up the adoptable animals, get them healthy and find them homes. With few residences to adopt as well as our on going struggles, local adoptions are difficult. We must transport out of state. Thus far the Adoption Day concept with rescue groups in other states has gotten a wonderful response. We need more groups to offer to do adoption days with our animals..